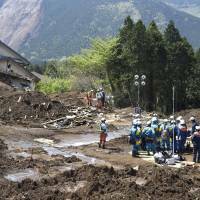 KUMAMOTO - Rescuers resumed a desperate search Friday for people believed buried under mud in the quake-struck village of Minamiaso, Kumamoto Prefecture. Some 1,400 police officers and Self-Defense Forces personnel hunted for two people reported missing, including Hikaru Yamato, 22, a college student from Aso in the prefecture. Volunteers mucked in to help distribute food and supplies at evacuation centers in Kumamoto Prefecture and nearby. Some shoveled debris and helped to clean up homes. Some 700 people reported to authorities in the city of Kumamoto on Friday morning, the first batch of volunteers to be accepted by the city. Around 50,000 people remain in evacuation centers across the region, unable to go home because of damage to buildings or because experts have not yet certified them safe. Some have chosen to evacuate because electric and water services are out. More than a week has passed since the initial magnitude-6.5 quake on April 14, which was followed by a magnitude-7.3 quake on Saturday. While the death toll from the quakes stands at 48, another 11 people are thought to have died from complications stemming from the stress and fatigue of living as evacuees. On Friday, the government of Kumamoto Prefecture confirmed the death in a hospital of a woman in her 70s who suffered chest pains after sheltering in a vehicle. So-called “economy class syndrome” has been suspected in several of the deaths. As of Thursday, 89,513 people from Kumamoto Prefecture and 637 from Oita Prefecture were reported to have evacuated from their homes. There were 10,271 confirmed damaged buildings. Water and gas supplies remained out in some places, although power supplies were fully restored by Wednesday. The hardest-hit Kumamoto town of Mashiki received about 200 fresh volunteers Friday morning. The town began accepting volunteers the day before, but with roughly half of its dwellings flattened or damaged, it has been limiting their work to evacuation centers amid persistent aftershocks. 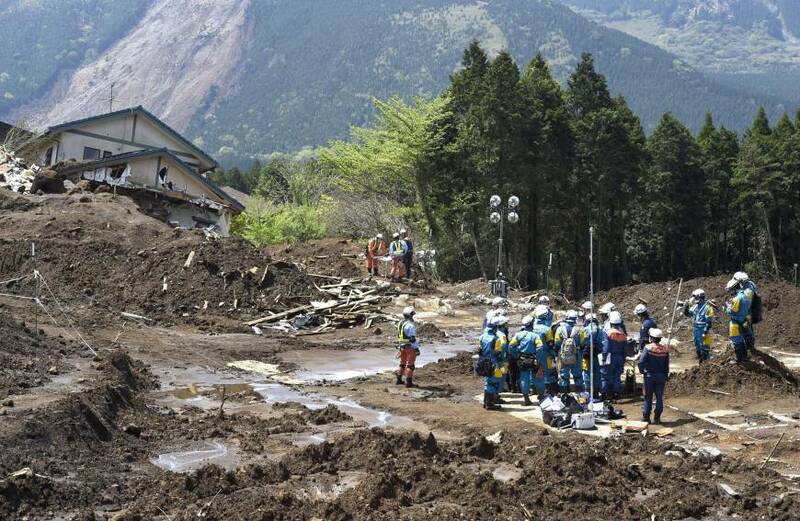 More than 790 seismic events ranging from minor jolts to strong earthquakes were detected in the region since the initial quake, according to the Japan Meteorological Agency. A team of researchers led by Tokyo Denki University professor Susumu Yasuda, who surveyed Kumamoto and Mashiki after the powerful quakes, said they found dozens of cases of ground liquefaction along rivers and at other locations in the area. In some cases, buildings were left askew or foundations were visible as previously solid, but water-soaked ground, flowed away during the violent shaking. Prime Minister Shinzo Abe plans to visit the quake-hit areas in Kumamoto on Saturday, Natsuo Yamaguchi, head of Komeito, told reporters after talks at the prime minister’s office.